The friendly folks over at Saber Interactive, the developer for titles such as NBA 2K Playgrounds 2 and Quake Champions, set up a suite at GDC ’19 to show off their upcoming title World War Z and invited me to come check out both the multiplayer and the co-op campaign. Within minutes of walking in the door, I was knee deep in zombies playing a multiplayer match with them, and ultimately taking out the entire other team with one well placed rocket. It’s not everyday you can strike the winning blow against the folks that actually made the game in a multiplayer death match, but when you do, it makes victory much sweeter. 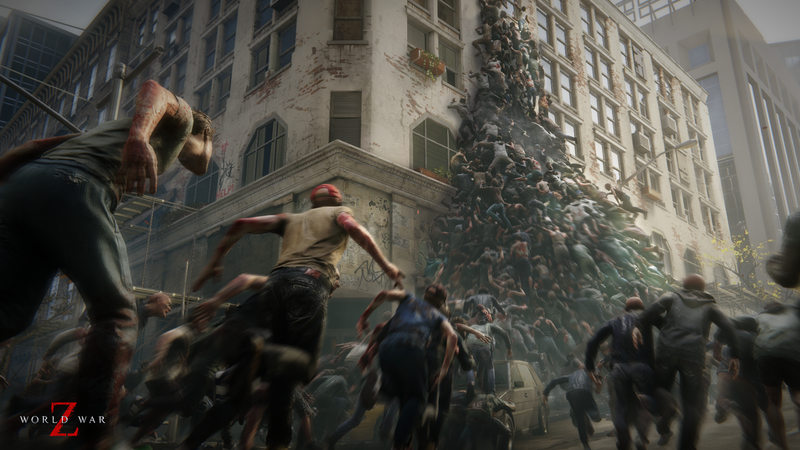 The title World War Z first originated in 2006 as a book by Max Brooks, which in turn was then loosely turned into a blockbuster movie starring Brad Pitt in 2013. There are mobile games attributed to the series, but a PC or console game hasn’t yet made it to market, well, at least until April 16th when Saber Interactive’s World War Z is set to launch. In the book there are multiple stories about folks surviving in multiple locations, while the movie takes a more linear approach and just follows Brad around as he fights off zombies and tries to stop the pandemic. About the only thing the movie and the book have in common are zombies and the title. The game takes the same approach as the book, which to me was the smarter choice, and creates an episodic series that takes place in four different locales, with the full intention of adding future locales as DLC. Three of the locations announced so far are Moscow, Jerusalem, and New York, each with their own specific climate and geography. Moscow in the winter looks pretty damn cold so I hope you remember your parka. The screenshots from New York are also impressive, but I only saw Jerusalem in-game. 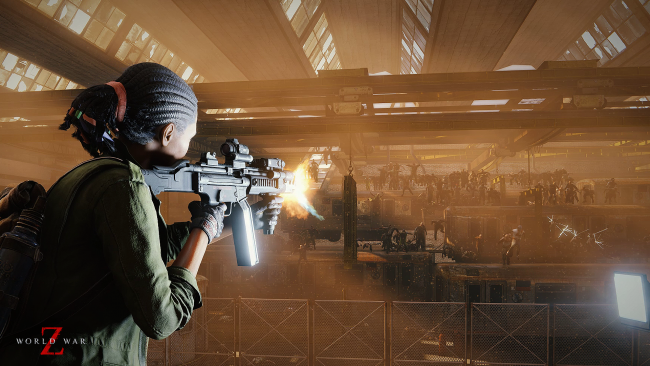 The campaign is designed to be played in co-op mode so you always have a full team of four, even if you are by yourself or just have a friend or two to help. The game fills out your team with bots when needed to ensure a full team, and the AI is said to be competent. I played with a full team of developers so I can’t attest to that yet. Game progress will be saved for every teammate, so no need to change hosts and repeat levels to make sure everyone gets credit for level completion. We played through the Jerusalem episode and it was murderously fantastic. The weapons in the game were perfectly deadly against the zombies, with assault rifles, shotguns, hand guns, heavy weapons with explosive ammo, and even some melee weapons to slice and dice with. I only had a machete for said slicing but one of the other guys had a chainsaw with an extended bar that turned the undead into mulch. The level of death and destruction that we left in our wake along our journey was unmatched in any game I’ve seen to date. In the movie, the zombies weren’t these slow walking, singular entities that were only out to eat you. They were more of a hive mind collective that would work together to achieve a goal. The developers were able to duplicate this effect with the zombie hordes in-game to a terrifying level. Just taking the high ground against a mass of the undead does not guarantee your safety as they will pile up and make an undead ladder to reach you. At one point we were up on a 30-foot platform and they still managed to climb up to us. WTH DUDE?! This was seen in the movie countless times, but to replicate that in-game, with gaming engines currently on the market, turned out to be an impossible task. Developer Saber Interactive’s only option was to create something themselves and it is called the Swarm Engine. Most gamers have probably seen levels where there are maybe 30 or 40 bad guys, max. 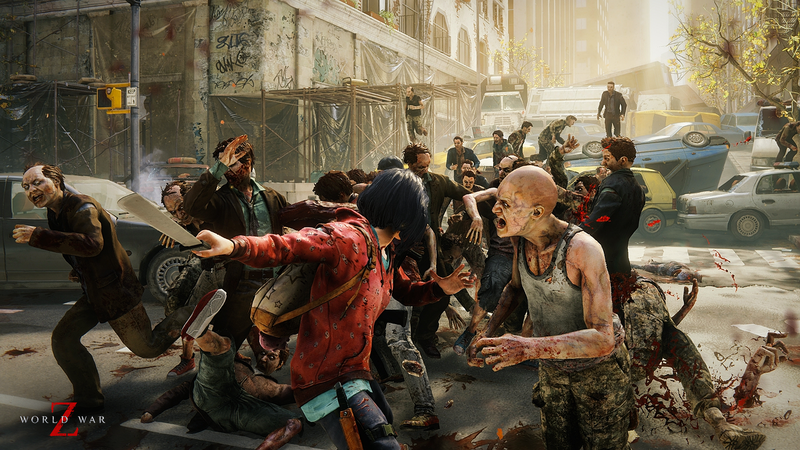 With the Swarm Engine there can be upwards of 500 zombies at a time. Five hundred! Just wanted to make sure you didn’t think you read that wrong. That is an insane amount of zombies, and blasting through them leaves an incredible amount of carnage with a dismemberment system that is so gory, but yet so impressive. 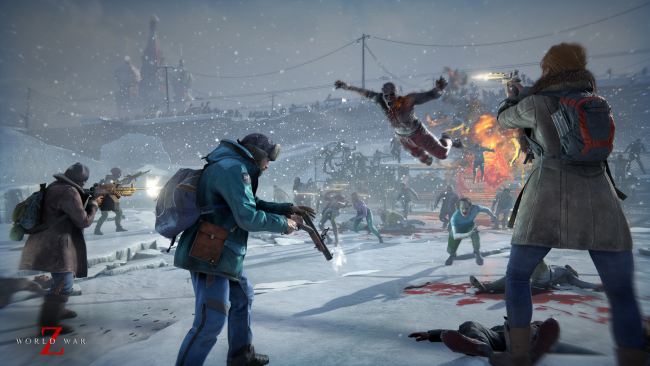 World War Z is set to release in less than a month so keep an eye out for our review when it drops. The body count in this game is going to be epic!